Dedham has been overrun with bunnies over the past few months; giant, multicolored, whimsical fiberglass bunnies peacefully crouching in parks, on sidewalks and by roadsides around town. The bunnies are part of the Dedham Public Art Project, sponsored by the non-profit organization Dedham Shines, whose mission is to promote “a vibrant community through programs that cultivate civic engagement and support for art, education, and culture.” The bunny form is modeled after the familiar “crouching rabbit” figure featured on Dedham Pottery original and reproduction pieces. Fifteen artists in all were selected by jury to paint the bunnies, which will be auctioned off with proceeds going to Dedham Shines in support of the arts in town. As of today, almost all of the bunnies have been installed all across town. This is the tale of one of those bunnies, “Regal Rabbit,” designed and painted by Catherine Gruetzke-Blais of Framingham. For more information about the Dedham Public Art Project, and to see photos of all the bunnies that have been placed so far, click on the link to the Dedham Shines website at right. June 25, 2012 The bunny who will become known as “Regal Rabbit” sits in the garage of Dedham Shines Co-President Jennifer Barsamian after traveling from Chicago where he was custom-designed and manufactured by Cowpainters, an art studio that specializes in producing fiberglass forms for public art displays. 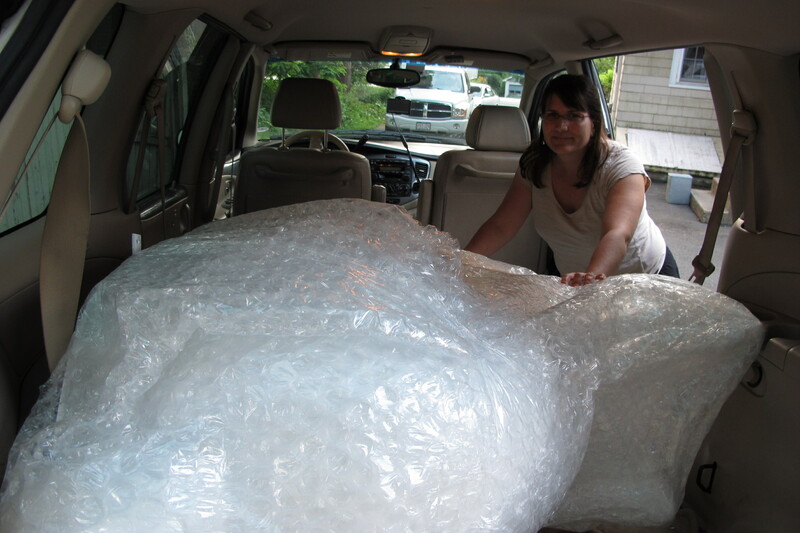 Artist Catherine Gruetzke-Blais and Dedham Shines Co-President Monika Wilkinson lift the bunny (he’s actually hollow and not too heavy) and head for Catherine’s mini-van. 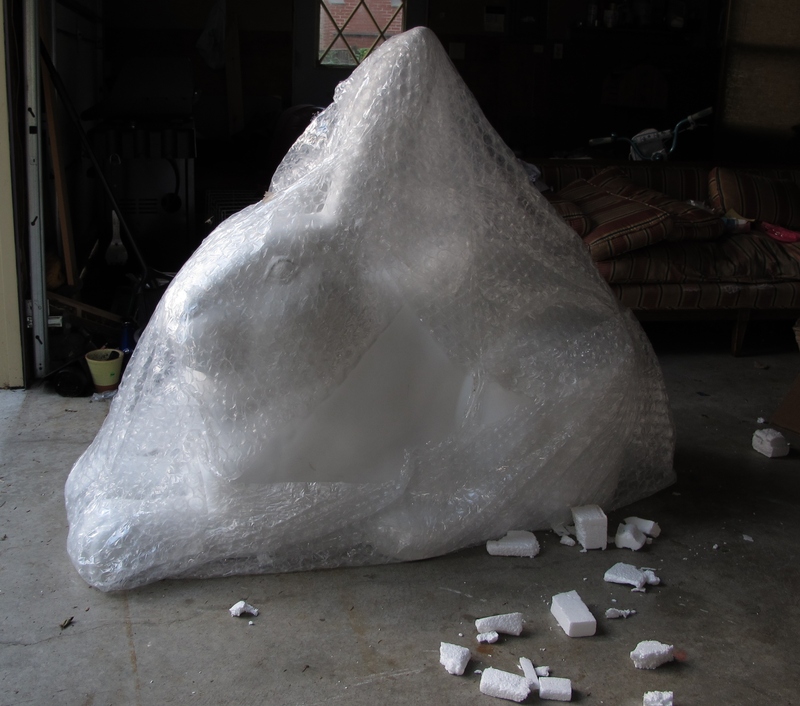 With the bunny safely tucked in, Catherine gets ready for the ride home to Framingham, where her artistic vision will transform this plain white rabbit into something magical. Whenever I mention to people that I am a member of this esteemed organization, the first words out of their mouths are almost always “Are there even any horses in Dedham?” So I explain to them that about a hundred years ago the society shifted its focus from the apprehension of horse thieves to the consumption of a roast beef dinner and enjoyment of a clever entertainment at its annual meeting, although in the hundred years previous to that horse pilferers were pursued vigorously , not just in Dedham but in Norfolk County and beyond, besides which, the important fact is that this organization which is a remnant from our pre-law enforcement past has remained in existence for over two centuries and isn’t that an incredible achievement to which they respond. “Yeah, but are there even any horses in Dedham?” And thus my quest began. I know there used to be horses in Dedham; I’ve seen them myself. The last time I remember seeing a horse that wasn’t part of a parade was at the Animal Rescue League on Pine Street. I know that the original purpose of that facility when it was founded was to rescue worn out and abused horses and give them a peaceful last few days here on earth. When the end was near, the horse would quietly walk into an inviting stall filled with hay, which was actually electrified and called “The Blessed House of Release.” In the 1980’s the Equine Rescue and Rehabilitation program was reestablished at Pine Ridge and that’s where I saw a horse happily cantering just a few years ago. But alas, due to construction at the site, all the horses have been moved to their Brewster facility. The other time I recall seeing horses in town was right in my own neighborhood of Tower Street, between Paul Park and the Capen School. At at the end of my street there lived two horses, Big John and Jodie. Jodie was a Shetland pony, and Big John was a …big horse. I’d often see them being ridden and every so often being chased by their owners down my street. But that was over 30 years ago. 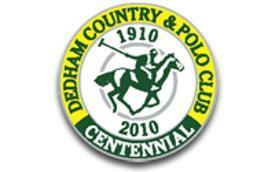 Then I thought of The Dedham Country and Polo Club on Westfield Street. I know that it was founded in 1910 and that polo was once played along the banks of the Charles at Samuel Warren’s estate called Karlstein. A quick look at their website however showed me that the main interests at the club these days are weddings and golf, and the only place you’ll see a horse is on their logo. While I was on the internet I googled “horses in Dedham” and hit pay dirt. I should have started here to begin with. I found an ad for a horse for sale in Dedham! A five year old dark bay mare clean limbed and straight moving, great jumper, and only £1600! 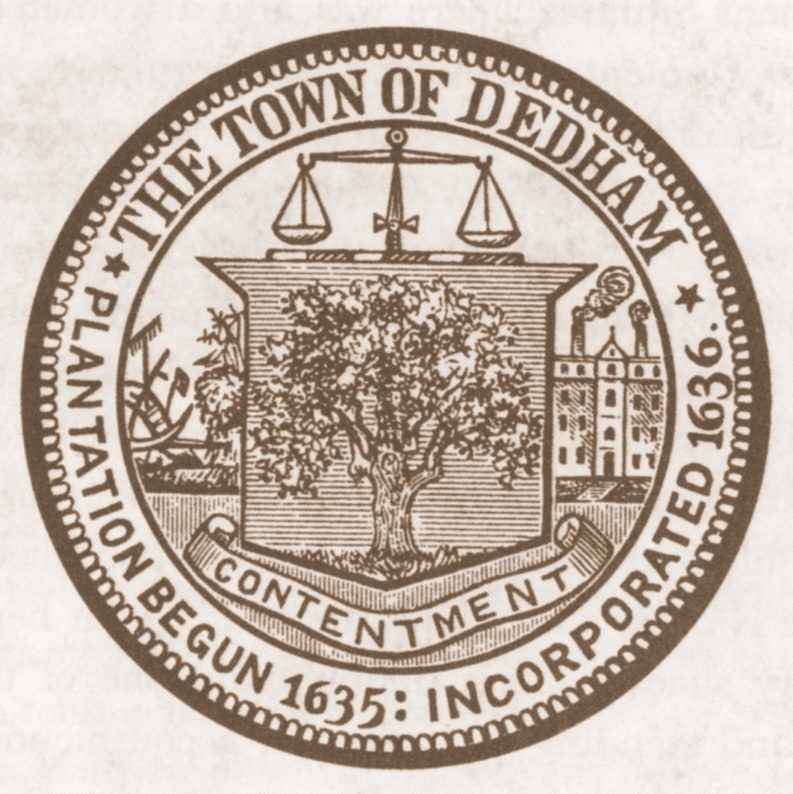 When I refined my search to Dedham, Massachusetts, USA…nothing. I thought I should ask former president and friend Frank Walley. Like me, Frank is the great grandson of a blacksmith. The family business is now insurance, and when I talked to Frank he told me that while he has insured many a Mustang and Bronco over the years, they were not of the Equine variety. So now I’m starting to get frustrated. 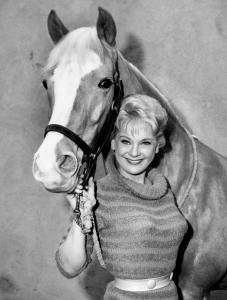 I can’t believe that there is not a single solitary horse to be found in the hometown of the woman who grew up to star on TV as the wife of a man who owned a talking horse! I’m talking (of course, of course) of Connie Hines (DHS 1948) who played Carol Post on the old Mr. Ed show back in the sixties. I have to admit that I was aware all along where I could easily find an answer to the question “Are there even any horses in Dedham?” We all know that in order to keep a horse, donkey mule, pony, llama, bovine, goat, sheep, alpaca or other large animal, here to known as “large animals,” one must provide an acre of land for the first animal, 2/3 of an acre for each subsequent animal, furnish an MMP (Manure Management Plan and), locate the facility for housing the animal 100 feet from any wetland or well, public or private, and obtain a permit from the town’s Board of Health. 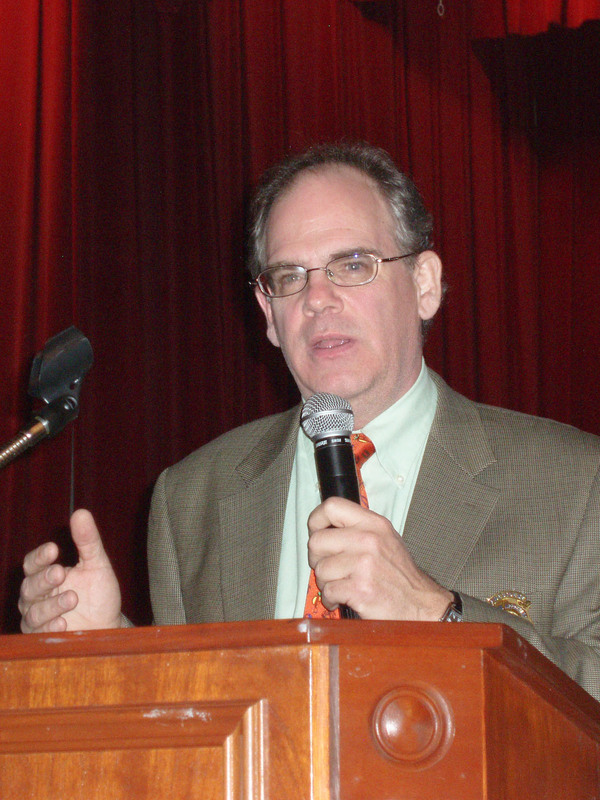 One phone call to town hall could end this quest, and with trepidation I made that call. And was told that at present there are no permits on file for permission to stable a horse in town. Lots of chickens, no horses. But I have not given up. During my quest I came upon a story from a few years ago about a couple who had been harboring a paint mare named Fancy in a garage on Congress Place off of Bussey Street. The neighbors were upset because the horse was there without a permit and they did not want a “large animal” living in their quiet suburban neighborhood. Eventually Fancy found a temporary home in Westwood, but the story gives me hope. If there could be one illegal horse hidden in town, there could be two, a dozen, even hundreds hiding out in garages, garden sheds and in-law apartments. We just can’t be sure. So the next time someone asks me “Are there even any horses in Dedham, I will reply, there just might be, and if there are, they can rest assured knowing that I and the rest of the members of SIDFAHT are ever vigilant. 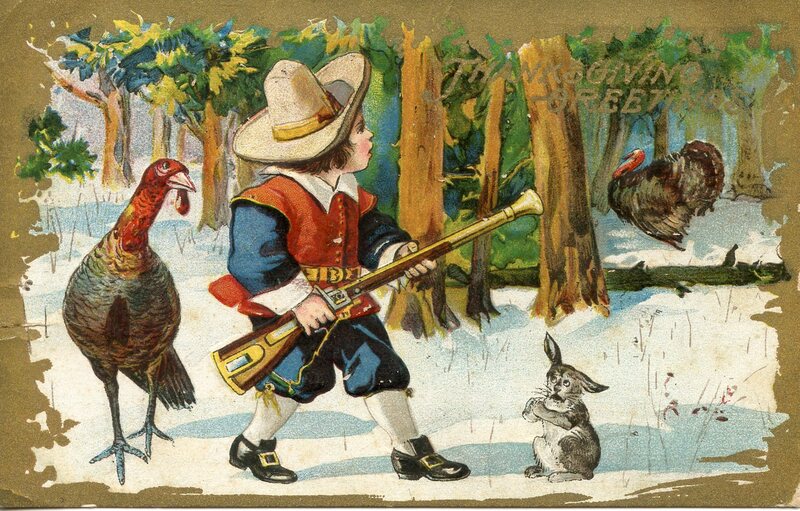 Happy Thanksgiving to all from Dedham Tales! 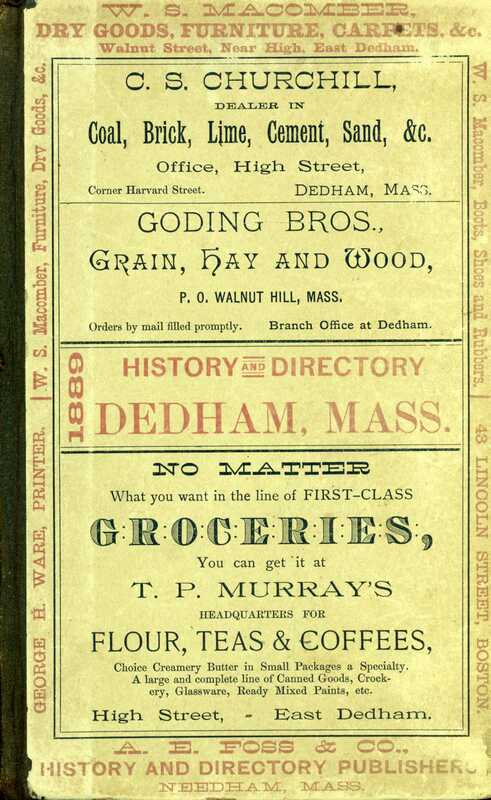 Reading through the 1889 Dedham Directory gives you a pretty good picture of life in Shiretown in the late 19th century. 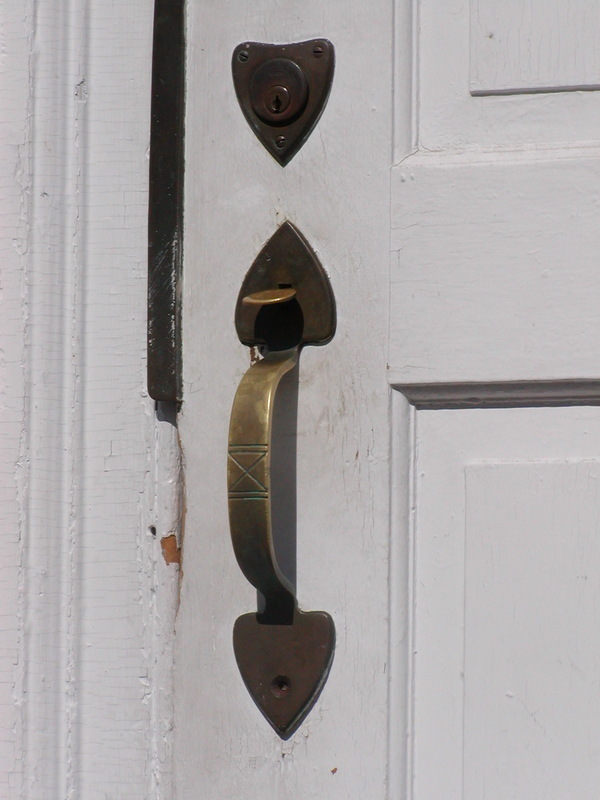 The population at the time was 6,641, including those living in West Dedham who would become residents of Westwood in 1897 when that town seceded. 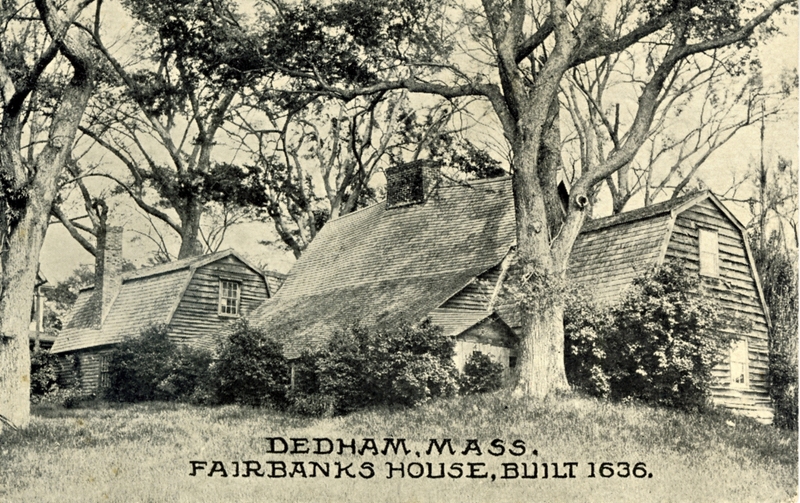 Dedham also had about twice the land area that it does now. For a small town, it offered just about everything you needed for your home, your business, and your social life. 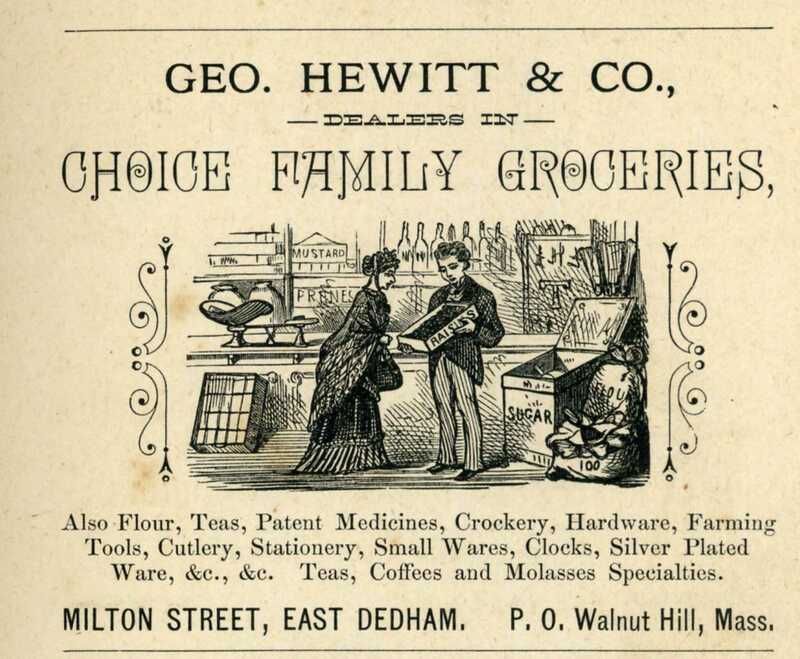 All of the following products were produced in town in 1889: boots, cabinets, chocolate, carriages, cigars, dresses, harnesses, slippers, suspenders, soap, tools, watches, and whips. The directory lists 10 blacksmiths, 6 boarding houses, 5 hotels, 2 ice dealers, 17 grocers, 7 physicians and surgeons, 4 lawyers, 17 dressmakers and 1 dentist. Remarkably, this town of under 10,000 residents had 7 post offices! Almost all of these were located inside railroad depots or grocers. The listing of residents includes occupations as well as addresses. In 1889, a great number of Dedhamites either worked in the mills or for the Old Colony Railroad. Those are pretty big raisins! 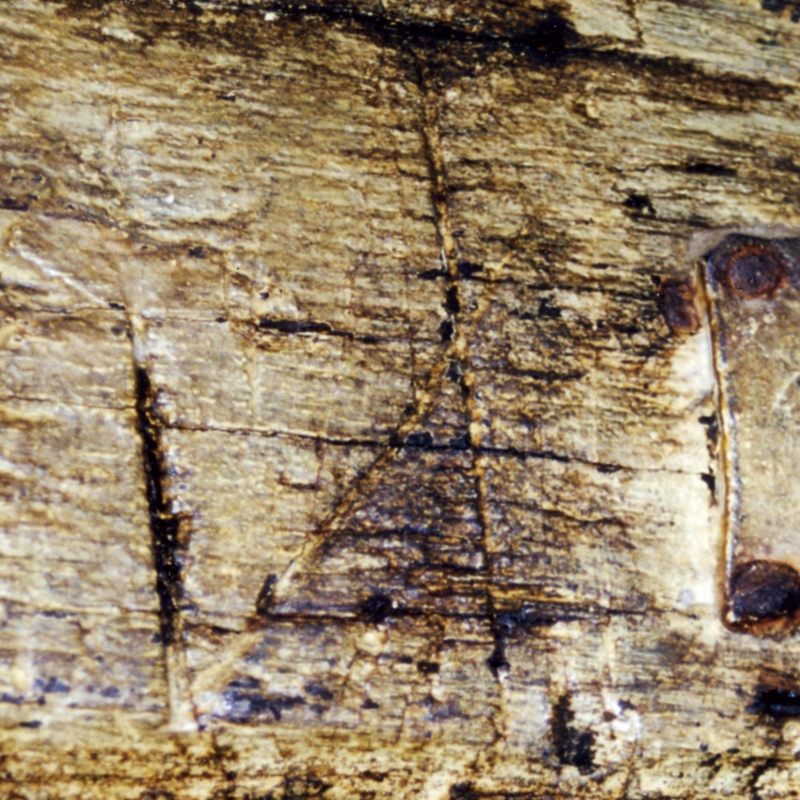 Walnut Hill was the name given to the area surrounding the intersection of High St. and Walnut St. in East Dedham.